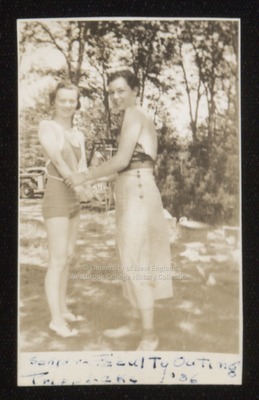 Two Westbrook Junior College students grasp hands in this sepia toned candid snapshot labeled Senior Faculty Outing Txxxxxx [illigible] 1936 on the front. On the back is written in blue ink: Mayberry & Savage. Mayberry wears a one-piece bathing suit while Savage wears a mid-calf length skirt and halter top. Both sport oxfords. Savage with socks, Mayberry without.